The 51.8 metre sailing yacht Mondango 2, jointly listed for sale by Burgess and Stockbridge Yacht Brokers, has been sold with the buyer introduced by Alex Lees-Buckley at Camper & Nicholsons. Built in aluminium by New Zealand yard Alloy Yachts to Lloyd's class and designed by Dubois Naval Architects, she was delivered in 2008 as a ketch rigged sailing yacht. Her interior by Reymond Langton accommodates 10 guests in five cabins consisting of a full-beam master suite, two VIP double suites and two twin cabins plus two Pullman berths. All cabins have entertainment centres, television screens and access to the Kaleidescape on demand audio/visual server. Situated behind the bridge, the saloon has comfortable seating and dining facilities and comes with a 65 inch television screen connected to over 500 feature films. Afresco entertaining and dining in style is available on the aft cockpit area which features a custom curved glass rear window and side windows that open and close electronically. When open, they are ideal for giving guests a welcome breath of fresh air while dining. When closed, they create a climate-controlled single level extension to the main saloon. A large flybridge offers panoramic views, seating and a barbecue while on the foredeck is a Jacuzzi tub. In the forward section below are one double and four twin crew cabins, all with en suite shower facilities, a crew mess, galley and laundry. Finished to exceptionally high standards, she has fulfilled the brief for a stylish yacht capable of fast, comfortable ocean passages. Her 1,200hp Caterpillar engine gives her an awesome range of 7,200 nautical miles at 10 knots. 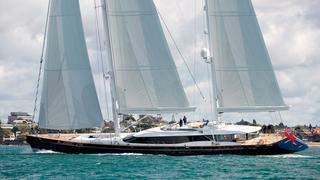 Lying in the Western Mediterranean, Mondango 2 was asking €17.9 million.